Learn to Ride a Bike! 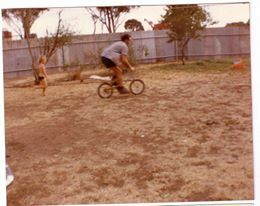 Learning to ride a bike is a bit like learning to drive a car. Initially it can be quite scary, and takes a lot of focus just to learn the basic controls of the vehicle. However with guidance and practice, eventually these basic skills become second nature, allowing you to shift your attention to learning other important skills - such as signals and road rules, and interacting with traffic! Learning to ride a bike is a similar process. At first, even the act of balancing well enough to stay upright will seem like an insurmountable barrier! But with gentle and patient guidance, we will progressively develop your skills and help you gain a 'feel' for the bike, in a way that allows you to build your confidence whilst minimising the risk of falling. You may have never learned to ride a bike, or maybe you learnt a little as a child but haven't ridden since, and feel a bit rusty. Or perhaps you've tried to teach your child how to ride, and it has ended in tears of frustration for both of you! Sometimes the best thing is to get outside help. No need to be embarrassed - I'm excited that you've gotten this far!! So don't delay, take the next step and contact me. In most cases I can have students up and riding within 1 or 2 sessions! Suitable for: Adults and children aged 8 and over. You will need your own bike. If you don't have a bike, consider borrowing from a friend, or hiring/renting one. If this presents a difficulty, don't let it stop you! Contact me and we'll try to find a solution for you. Location: In a quiet space, in the Inner East of Melbourne (eg Kew, Kew East, Balwyn, Ivanhoe, Hawthorn). I can travel to your area on request - cost varies depending on distance. Investment: $190 for 3 hours. For adults, choose between 2x 1.5hr, or 3x 1hr sessions. For children aged 8-10 I recommend 3x 1 hour sessions.